Viveca Smith Publishing, 9780974055145, 274pp. Rock Pounder, adventure rider extraordinaire, is planning a round-the-world trip on his motorcycle. His goal is Amsterdam and the herbal refreshment that awaits him there. But when you're a legend--among women, adventure riders, and spies--nothing is ever as simple as it seems. There's a reason that Rock Pounder's picture hangs in the best brothels in Amsterdam. His abilities are legendary, as women around the world will tell you. Rock has ridden the famous Road of Bones in Russia. He's traveled the snake-infested jungles of Central America, all the way through the Darien Gap, where no riders dare to travel. And with his trusty dirt bike, he's climbed the great peaks of the Himalayas. Rock Pounder, a man of many wiles, matches wits with the CIA, the KGB, and the Russian mafia. The journey will take him places he never expected to go. But when Rock Pounder is on a mission, no one stands in his way, except, maybe, a tall blonde who means nothing but trouble. 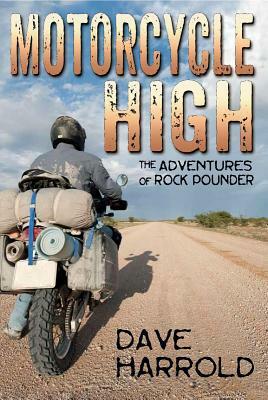 Dave Harrold is a professional adventure rider who has traveled around the world on his motorcycle. He lives in McKinney, Texas.